In 1696, plans for a baroque summer palace were commissioned by Electress Sophie Charlotte; the building was already inaugurated in 1699. The queen's residence was extended into a three wing building, inspired by Versailles, after her husband Friedrich crowned himself King of Prussia in 1701, befitting their new status. When she died in 1705, the palace was renamed after her and the surrounding settlement, known previously as Lietzow, was called Charlottenburg. Following designs by Knobelsdorff, the new east wing was built in 1740 during the reign of Frederick the Great. 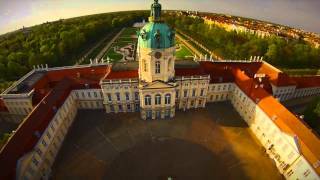 Charlottenburg palace is now a museum; enjoy a stroll through the beautiful park. This temple of consumption created quite a stir when it first opened its doors in 1907: Modelled after American department stores, haute couture from Paris and tropical fruit from exotic lands were grandly presented with other merchandise in 120 different departments. It catered to the “discriminating tastes of the Upper Ten Thousand, high society and the upper crust”. On a good day, up to 180,000 customers now visit KaDeWe – which has undergone much remodelling and renovations – where they are served by a staff of 2,000 across more than 60,000 square metres of retail space. A small tip: The gourmet department on the 6th floor is especially always worth a visit! In the 1890ies Emperor Wilhelm II. commissioned the erection of the Memorial Church in honour of his grandfather Wilhelm I., who had been the first German Emperor since 1871. Architect Franz Schwechten designed a large neo-Romanesque building with a rich interior decoration. The air raids of World War II left over only fragments. In the 1950ies West Berlin's Senate demanded the creation of a modern church as a landmark of the new City West, instead of reconstructing the old church as wished by the congregation. As a compromise architect Egon Eiermann realized an ensemble of modern structures around the preserved old main tower. Hitler used the Olympic Games of 1936 to present Germany as a sovereign country. In the centre of a 132 hectare large sports park the Olympic stadium was built with a capacity for approximately 100,000 spectators. 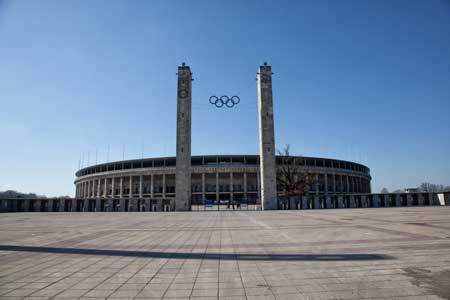 Today many visitors also associate the Olympic Stadium with the final of the DFB-cup, the Football World Championship 2006, the football club Hertha BSC, ISTAF and rock concerts of the most famous. Since its refurbishment between 2000 and 2004, it has become one of the most visited attractions of Berlin. 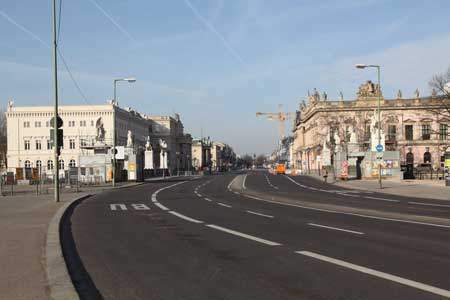 The first step towards transforming the street into a boulevard was taken by the prince-elector Friedrich Wilhelm. From 1647 on he gave orders to plant lime and walnut trees along the avenue, and by and by, residential buildings for the nobility, high-ranking military personnel and rich families were erected. After the foundation of the imperial Reich in 1871, the avenue became a commercial street. Famous cafés, glittering temples of consumerism, branches of countless companies and banks made sure that business kept swinging. 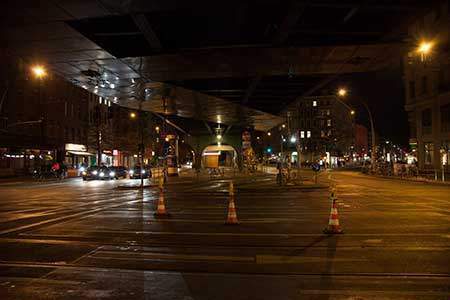 After German reunification the renowned boulevard changed its character again and several companies as well as institutions use it for their presentation. Pariser Platz was recognized as one of the noblest squares of Berlin before its destruction in World War II. In its centre you can find the Bran¬denburg Gate, the best known landmark of the city. Many people remember the time in which this square was waste land and the Berlin Wall stood behind the gate. In 1961, it became the symbol of the separation of Germany. This meaning changed immediately with the Fall of the Wall in 1989. 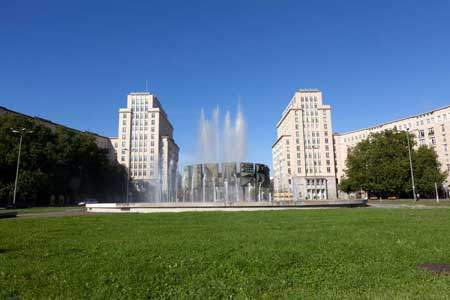 The redevelopment of Pariser Platz was a project of prime importance in the early 1990ies. With several embassies, the Adlon Hotel and the Academy of Arts it counts among Berlin's most prestigious addresses today. This is the most beautiful – and only remaining – historic city gate of Berlin. It was erected from 1788 to 1791 after designs by C. G. Langhans who had been inspired by the Propylaeum, the entrance gate to the Acropolis of Athens. The sculptor J. G. Schadow created the quadriga standing on its top. In 1945 the famous landmark was destroyed. 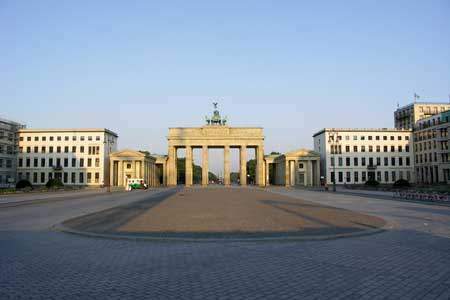 After the division of Berlin into four Allied sectors, the Brandenburg Gate belonged to East Berlin and was rebuilt. With the construction of the Berlin Wall in 1961, it was standing within the no man's land and could no longer be visited. 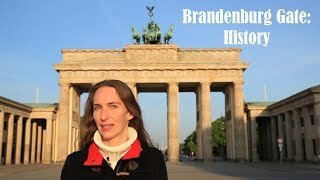 The Fall of the Wall in 1989 again and again drew tens of thousands of visitors to celebrate the defeat of Germany's separation at the Brandenburg Gate. And so, it became a symbol of the reunification. The United States of America acquired a stately palace at the southern edge of Pariser Platz in 1931. 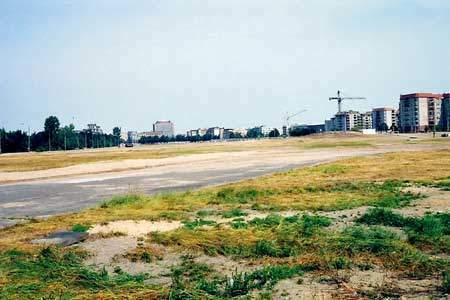 After the war-ravaged building had been dismantled, its site was left empty because it had become part of the no man's land in front of the Berlin Wall. 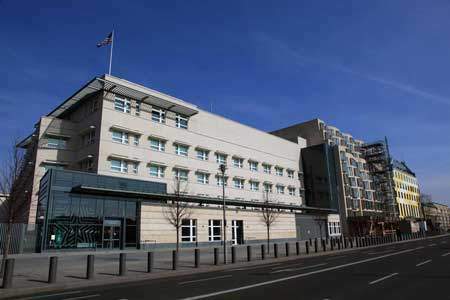 After German reunification, the USA wanted to develop a new embassy on their historical premise. But fearing terrorist attacks, they demanded a security corridor of 30m width. The Berlin Senate declined to declare parts of the Pariser Platz and the Brandenburg Gate a prohibited area. A compromise was found and in 2008 the new building, designed by Moore Ruble Yudell, was opened, hiding the parts relevant to security deep in the centre of the structure. To the right of the Adlon Hotel and the glass façade of the Academy of Arts you can find the building of the DZ Bank, which was finished in 2001 and on first glance seems to be quite minimalist. But the regular rhythm of its wall and window surfaces stands in deep contrast to the interior of the building. Here, the architect Frank O. Gehry, famous for his deconstructivist and imaginative designs, was allowed to do as he wished. In the middle of the building he created a huge, curved room sculpture, which seems to go beyond the scope of architecture. Already in 1860, France settled down here at the northern side of Pariser Platz. The cultural and social gatherings in its embassy advanced to be top meeting points of the high society. In 1990, the premise, which had become waste land in the time of the German separation, was given back to France. The Parisian architect Christian de Portzamparc created the new building until 2002. 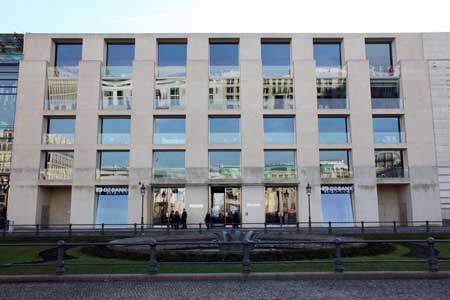 The slanting window openings of the inventively designed façade offer a great view on the Brandenburg Gate. In 1906/07, the hotelier Lorenz Adlon had built the monumental Hotel Adlon, which could meet the noble standards of the high society. All hotel rooms were equipped with electric light, central heating and domestic hot water – which were spectacularly modern for the time. Besides this the building had several luxurious rooms for social gatherings, such as a grand ballroom, a restaurant, a bar and a conservatory. 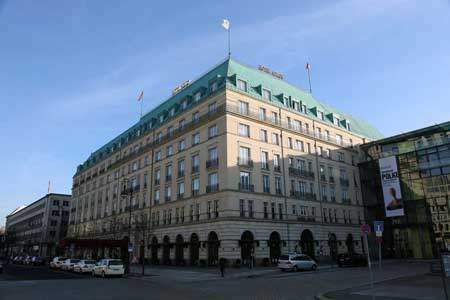 Having burnt down in the last days of war, today's Adlon is a reconstruction from 1995-97. Although showing a simplified façade it was designed to correspond with the historic hotel. Without doubt, it is one of the classiest places of accommodation for any Berlin-visitors who do not have to be too careful with their expenditure. At first glance the huge building on the southern side of Unter den Linden might appear to be a princely palace of the late 19th century. But if you take a closer look, you will find hammer and sickle symbols in its decoration; and the sculptures on the tower represent strong working class people. 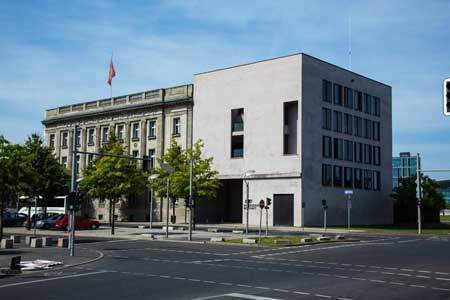 Between 1949 and 1952, the Soviet Union realised a new embassy in East Berlin in the pretentious style of the Stalin era, which should not only underline its own position of power, but also support the recently founded East German state. Over the years a building complex was developed here that contained apartments as well as a school and a swimming pool. Today the building is the embassy of the Russian Federation. One of the most beautiful squares in Berlin is the Gendarmenmarkt with the neoclassical Concert Hall in its middle, as well as the German and the French Church to its left and right. Its name derives from the Gens d'Armes, a cavalry unit of the Prussian kings that was accommodated here in the 18th century. In the 1780ies king Frederick II. ordered his architect Carl von Gontard to embellish the Gendarmenmarkt by constructing the two stately twin towers in front of the churches. Thus the square received a truly royal ambience. In 1821 architect Karl Friedrich Schinkel proudly supervised the inauguration of the Concert Hall, which in his days was the Royal National theatre. The splendid Baroque building on the western side of Bebelplatz is nicknamed “chest of drawers” because of its curved façade. Its opulent forms mark a contrast to what is generally known as Prussian Baroque style. The reason for this lies in the fact that this building is an architectural copy. King Frederick II. had taken a draft for an extension of the Viennese imperial palace and used it for his new library building at this square before the Austrian emperors had finished their project. With this cheeky plagiarism the Prussian king duped his powerful political rival and demonstrated that he was still able to build on a royal scale even though he had just led seven long years of war against Austria, Russia and France. 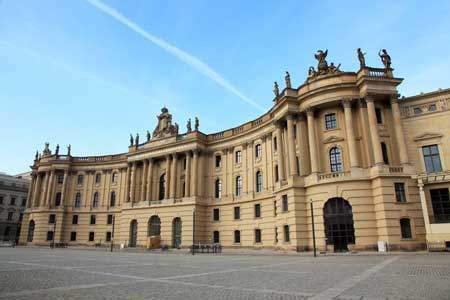 Today, the Humboldt University's faculty of law is situated in the building. 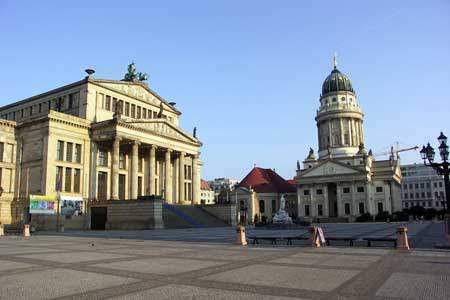 In 1817 a devastating fire had destroyed the “National Theatre” at the Gendarmenmarkt. Its company had become famous for performing works of great German playwrights such as Johann Wolfgang von Goethe and Friedrich Schiller. 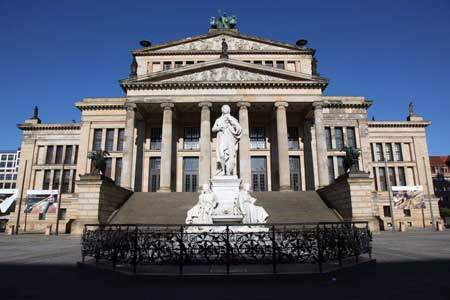 Now the architect Karl Friedrich Schinkel was given the order to create a new theatre. Since 1821 his neoclassical masterpiece dominated the square with its solemn monumentality. World War II left over only fragments of the former splendour. Up to 1984 the East German state reconstructed the building but reopened it as a concert hall. It is currently the most important venue for symphonic performances besides Berlin's Philharmonic in the western part of the city. The building, opened in 1743 as the Royal opera, was commissioned by King Frederick II. and designed by G. W. von Knobelsdorff. The elegant free standing opera was a sensation because it represented a new development in Europe: Until then opera halls were known as integrated parts of palaces but not as proud landmarks of a city. The State opera has an eventful history. It burned down several times, for instance during the bombardments of World War II. In the 1950ies, a costly reconstruction took place. In 2010 a modernisation program was started with the aim of improving the listening conditions and adapting the house to the technical requirements of the 21st century. 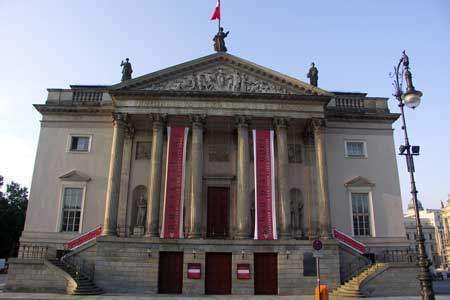 During the long and costly period of reconstruction the state opera is resident in the Schiller Theatre in Charlottenburg. At the rear part of the Bebelplatz, you can find St. Hedwig's Cathedral, which possesses an obvious model. Harking back to a wish of king Frederick II., the building was designed in the character of the Pantheon Temple in Rome. Against the backdrop of the conquest of Catholic dominated Silesia, the king decided to dedicate the church to this confession and to the Silesian patron Saint Hedwig. It was completed in 1773. In 1930 St. Hedwig's became a cathedral and since then has been the highest Catholic church of the city. After suffering heavy damage in World War II, the building was reconstructed. But instead of copying its original interior, a contemporary 1950ies style design was chosen. After his coronation Frederick the Great wanted to build a new palace for himself at the northern side of Unter den Linden. But in 1766 his brother Prince Heinrich moved in. 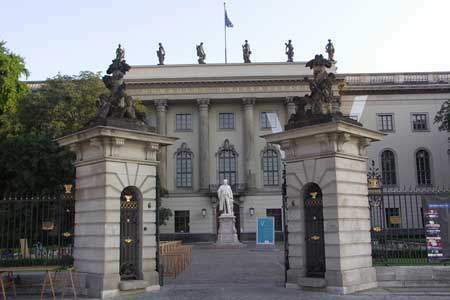 In 1810 the splendid structure became the seat of Berlin's first university which soon became one of the most renowned German scientific academies. Among others, the Nobel Prize winners Albert Einstein, Max Planck and Robert Koch worked here. The institution originally named after its founder, king Friedrich Wilhelm III., was renamed by the East German authorities in 1949 and has been called Humboldt University ever since. 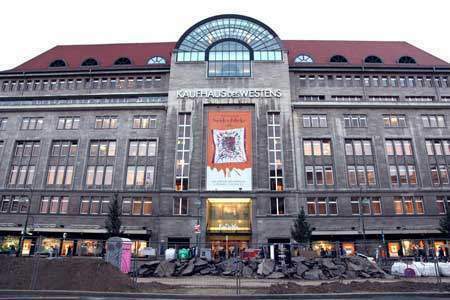 Currently this institution is one of four competing Berlin universities. The temple-like building standing slightly back from Unter den Linden was designed by K. F. Schinkel in 1818. It once served as a guard-house for the crown prince's palace on the other side of the street. With the end of the monarchy in 1918, the building lost its function. In 1931, the Weimar Republic opened it as a war memorial. After World War II, East Germany installed a new memorial here dedicated to the victims of fascism and militarism. In the 1990ies the interior was remodelled again: a replica of Käthe Kollwitz's touching sculpture Mother with her Dead Son was placed in the centre of the room. 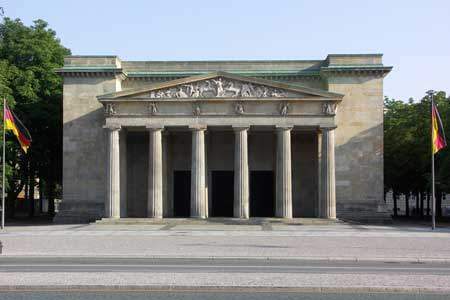 Today the Neue Wache is the central memorial for the victims of war and despotism of the Federal Republic of Germany. Do take some time to let it have an effect on you. The former Zeughaus arsenal is one of the most significant examples of Baroque architecture in Berlin. The builder-owner, King Friedrich I., immortalized himself by hanging his portrait in gilded bronze directly over the entrance. In the 18th century the building served as storage for all sorts of weapons, canons and even war trophies. In the 1870ies it was transformed into a Military Museum. After World War II it was reconstructed and reopened as historical museum by East Germany, explaining German history from a Marxist-Leninist point of view. 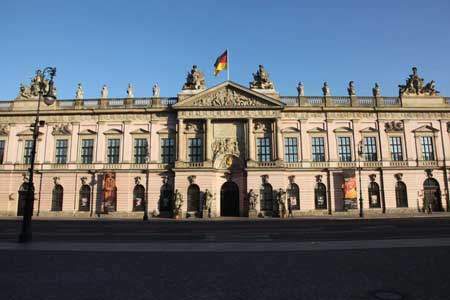 After Germany's reunification, the German Historical Museum was opened here, presenting the country's history from its beginnings to the present day. Emperor Wilhelm II. commissioned the construction of a new monumental church in the Lustgarten. 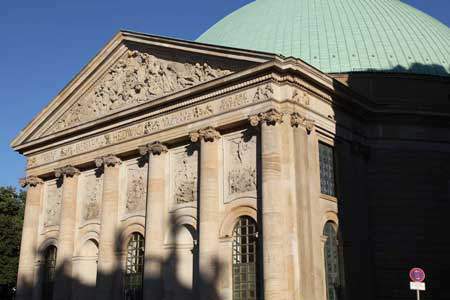 It was not only meant to be the chapel of the imperial court, but also the main church of Protestantism in Germany. The pompous domed structure, inspired by the Italian High Renaissance, was realised by the architect Julius Raschdorff between 1893 and 1905. After severe damage in World War II it was reconstructed in a simplified form. 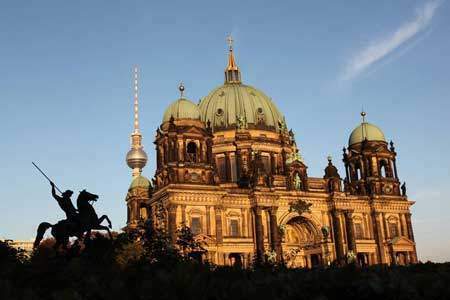 Today the Berlin Cathedral has an outstanding importance as the protestant main church of the federal states of Berlin and Brandenburg; besides church services concerts are regularly given there. In 1443, the Hohenzollern family started to build a castle on the Spree island. Between 1698 and 1713, it was transformed into an imposing Baroque palace by Friedrich III., who was crowned king in Prussia in 1701. This building became the dynasty's symbol of power, especially since 1871 as it was thenceforth the residence of the German emperors. After the end of monarchy in 1918 the palace became government property and was used as a museum. Since it was heavily damaged during World War II and the East German government was not interested in its reconstruction, the ruin was blown up in 1950 in order to give way for a socialist replanning of the city centre. Along the eastern edge of the Spree island, where the city palace once stood, construction work on the Palace of the Republic started in 1973. As the seat of parliament and one of the most prominent cultural sites of East Germany, the interior needed a design with a touch of luxury. The grand entrance hall with its flights of steps and galleries was covered over and over with glassy lights giving the house its nickname “Erich's lamp store”. After German reunification there was no political interest in preserving the Palace. 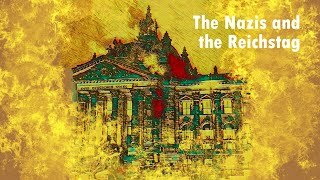 Instead a majority of the German parliament had voted for its demolition and the rebuilding of the Hohenzollern palace. The project worth 590 Million Euros carries the name “Humboldt Forum” and will become a museum for Berlin's Ethnological Collections. The Nikolai Quarter is where the origins of Berlin lie. History tells us that the city was founded by merchants in the late 12th century. But Berlin developed alongside a second town named Cölln. 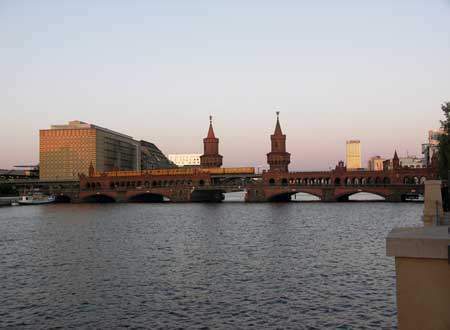 Both lay along a ford on the river Spree: Cölln on an island, and to its east, Berlin on the mainland. After having been heavily hit in World War II, the area – with only a few houses left standing – remained wasteland until the end of the 1970ies. Then the East German government rebuilt the quarter as a great prestige project. As a result a quite free and fragmentary reproduction of the old Berlin was created. Its inauguration was part of the celebrations in occasion of Berlin's 750th anniversary in 1987. 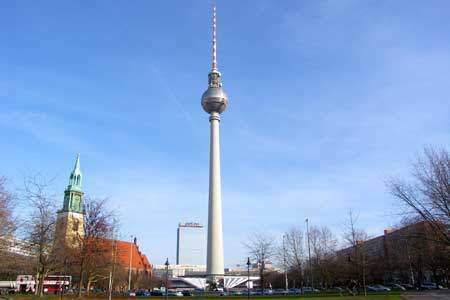 At 368 m, the Fernsehturm (TV Tower), erected between 1965-69, is Germany's tallest structure and a popular tourist attraction. 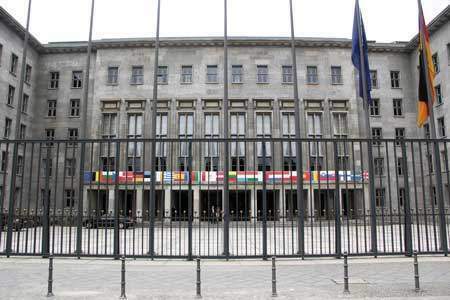 In addition to being a powerful broadcasting system, the building also served as an important political and urban symbol in the time of the Cold War because East Germany's prestigious project now also dominated West Berlin's skyline. Yet when the Head of State, Walter Ulbricht, inaugurated the tower in 1969 everyone involved must have breathed a sigh of relief: The cost of construction amounted to 200 million East German marks, a six-fold increase over the originally estimated budget. At a height of about 210 m, a restaurant and a viewing platform offer amazing views – enjoy it! The building of Hermann Göring's Reich Air Ministry was erected in 1935/36, based on the designs by architect Ernst Sagebiel. The monumental edifice with 56,000 square meters of usable floor space comprised roughly 2,000 offices. 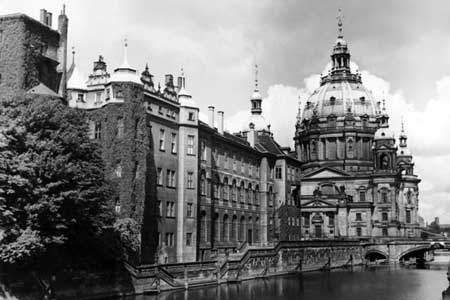 It was the first large government building for the Nazi regime. After 1945 the Nazi insignia were removed from the façade. 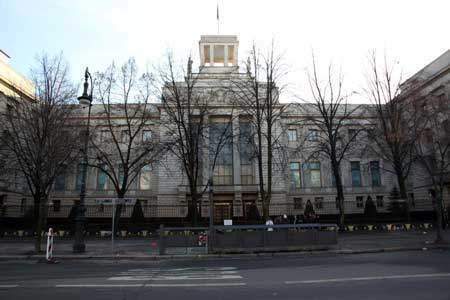 In 1949 the East German state was founded in this building which thenceforth served as "House of the Ministries". 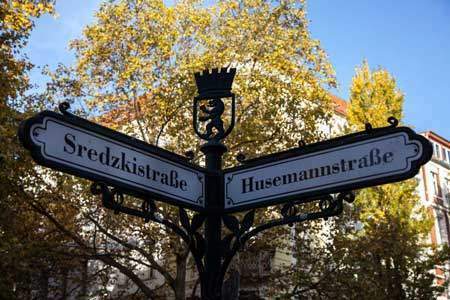 During the uprising of East Germany's citizens on June 17, 1953, it was the destination of protest marches. The complex history of what is today the Federal Ministry of Finance was taken into consideration when the building was renovated from 1996 to 2000. More than two decades after the fall of the Berlin Wall in November 1989, the city has grown together again and most remnants of the partition have quickly been removed. But in some places you still can experience the merciless way in which Berlin was divided over 28 years. 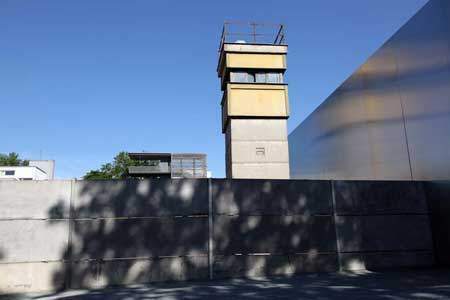 Especially the area along Bernauer Straße, close to Nordbahnhof station, gives you an impressive insight: a former “ghost station”, a partly cleared graveyard, the rests of a blown up church in the former “death strip” as well as a reconstructed part of the wall with a watchtower demonstrate the brutality of the border installations. The elegant building was a showcase of Karl-Marx-Allee. On two floors it offered a journey through the culinary delights of selected Soviet Republics and the concert cafe provided musical entertainment. At the same time the building was a political symbol, demonstrating the friendship between East Germany and the Soviet Union. The USSR appreciated it and expressed its thanks with an unusual present which became the trademark of the building: Beside the entrance, a model of the Sputnik-satellite rises on a pole towards the sky. It symbolised the early lead of the Soviets in space technology in the time of the Cold War. 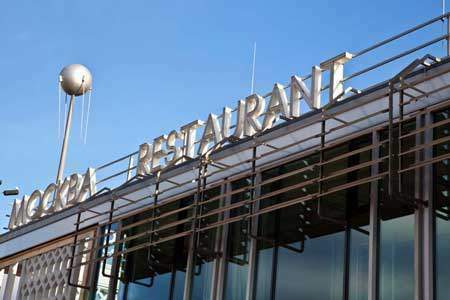 The state-run restaurant closed down following the end of the GDR. Today the modernised building serves as an event location. 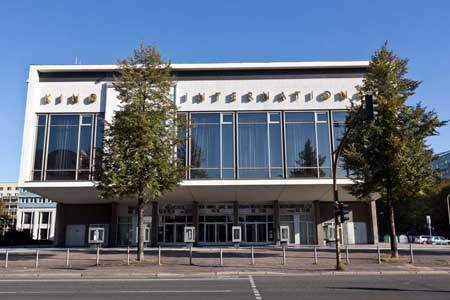 An architectural highlight of East Berlin's Karl-Marx-Allee is the Cinema International. Its auditorium with a foyer and a bar behind huge glass panels is set distinctively over the base of the building with the entrance and box offices. The cinema which still has kept much of its 1960ies interior design has a capacity for 600 guests. In the time of the GDR it was often used for premièring films of the state-run production company DEFA. 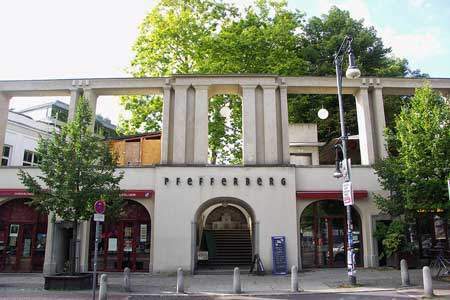 This extraordinary cinema made it through the tough 1990ies when many Berlin cinemas had to close down. It is still sometimes used for premières and it is one of the official locations of the Berlin Berlinale Film Festival. The Reichstag, which was built by the architect Paul Wallot and opened in 1894, stands for the continuity of Berlin as a capital. 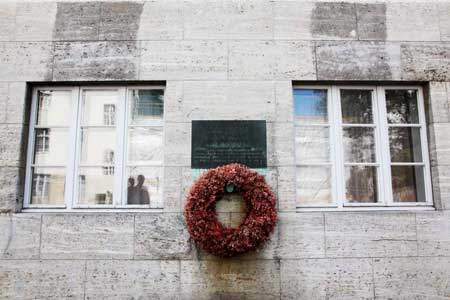 No other still existing political building is such a complex ambivalent focal point of German history: the German Empire, the Weimar Republic, the Third Reich and also the German separation have left their traces on its walls. The reunification can be detected in the building too: under the direction of Sir Norman Foster the parliament building of the German Bundestag received a modern interior and a transparent walkable cupola having become one of the most popular attractions of the city. 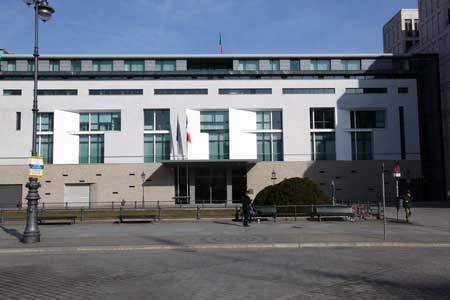 In 1991 the German parliament had decided to move the seat of parliament and government from Bonn to Berlin. 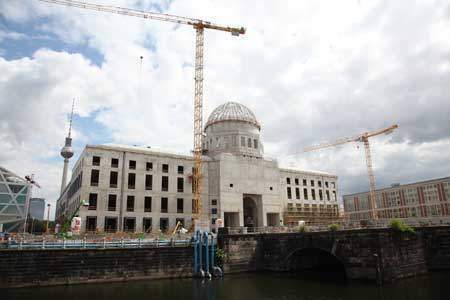 Afterwards a large scale construction programme was realised along the river Spree. 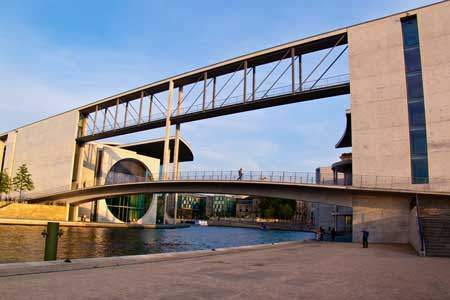 The architect Axel Schultes developed a ribbon-like ensemble of buildings crossing the Spree. This new urban structure links the banks of the river - which once belonged to East as well as West Berlin - in order to symbolize the German reunification. It includes the Federal Chancellery, designed by Schultes, and the Paul-Löbe-Haus and Marie-Elisabeth-Lüders-Haus. Both were realised by Stefan Braunfels and offer rooms for the parliament's committees, the archives and research services. Located in today's parliament and government district, the Swiss Embassy is all what remains from the Alsen quarter. This was a 19th century upper-class neighbourhood at the banks of the river Spree. The historic part of the building with its columned façade still gives a feel for the area's former splendour. With exception of the embassy, the Alsen quarter was demolished during the Third Reich to create room for Adolf Hitler's and Albert Speer's megalomaniac redevelopment plans for Berlin. After German reunification a modern wing was added in a minimalist style by Diener and Diener architects. The Victory Column once dominated the square in front of the Reichstag building. Adorned with captured cannons and the gilded sculpture of Victoria, it commemorated the founding of the German Empire in 1871. Due to Hitler's redevelopment plans for Berlin, envisaging a new north-south axis at its location, the monument was relocated to the Großer Stern square in 1938-39. During this occasion the column also was made taller by a new base as well as a fourth drum which was added beneath the goddess of victory. 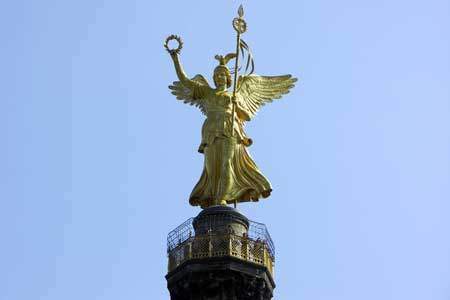 Since then the Golden Lizzy, as the sculpture is nicknamed, peers down from a height of 67 metres and the Siegessäule has become a clearly visible landmark within Tiergarten park. When in 1955 the removal of the war-damaged 19th century Hansa Quarter began, it was at the same time the start for one of the most prestigious residential building projects in West Berlin. Inspired by an optimistic belief in progress, new ideas of living in a metropolis were meant to be shown during the International Building Exhibition INTERBAU in 1957. 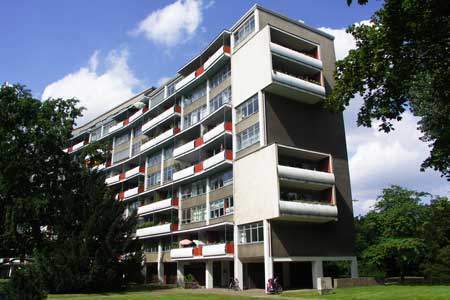 Following the modernist planning guideline of a “loosely arranged, green urban landscape”, renowned German and non-German architects, such as Walter Gropius, Alvar Aalto, Oscar Niemeyer and Arne Jacobsen, designed more than 30 buildings, demonstrating their concepts of high quality living. Thus the new Hansa Quarter became an important example of the post-war International Style. 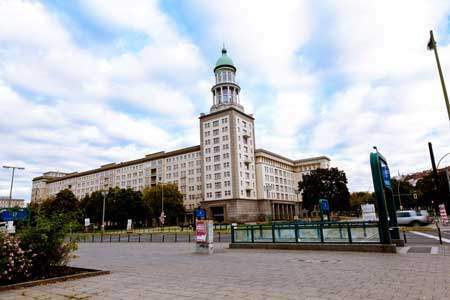 The Bendlerblock is part of a huge building complex that had served as the headquarters of various military installations since 1914. During World War II departments of the Army High Command were housed there. After the attempt to assassinate Hitler on July 20, 1944, the building attracted a great deal of attention when it became known it was the headquarters of the military resistance. In the early hours of July 21, just past midnight, General Olbricht, Colonel von Stauffenberg and others were executed in the courtyard. Colonel General Beck was shot in the building. A memorial in remembrance of these people is located in the courtyard. In 1993, the complex was deliberately chosen to be the second official residence of the Federal Ministery of Defence. In the early 20th century, this square had become the busiest traffic hub in Berlin. Furthermore it offered a broad range of amusement, for example in the Haus Vaterland where the Kempinski family had established an entertainment centre with gastronomy, dance and show program. With its vibrating liveliness the Potsdamer Platz contributed much to Berlin's reputation as a vital metropolis. Not much more than a myth of this place was left over after its destruction in World War II. With the construction of the Berlin Wall it was finally torn apart and became an area of wasteland with only three lonely houses still standing. After the Fall of the Wall, this area was meant to regain its former central position. Between 1994 and 2004, several investors, such as Daimler and Sony, became active in realizing large-scale projects making the new Potsdamer Platz the “biggest building site of Europe”. Many renowned architects, for example Renzo Piano, Richard Rogers, Arata Isozaki, David Chipperfield and Hans Kollhoff, created a broad spectrum of contemporary architecture here. The revitalization was successful, nowadays' Potsdamer Platz offers a mixture of living quarters, shops, restaurants and places of entertainment. 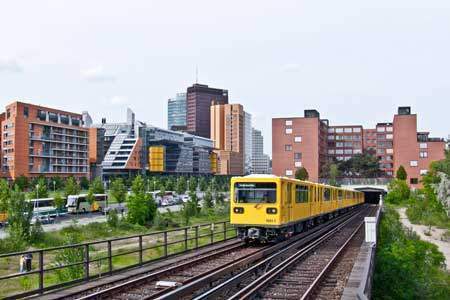 Between Ostbahnhof railway station and Elsenbrücke a townscape dominated by countless factories developed in the middle of the 19th century. Since 1896, the bridge “Oberbaumbrücke” connects the districts Friedrichshain and Kreuzberg. The splendid construction, which is built in the tradition of the Brandenburg Brick Gothic, has become one of the city's landmarks and to the same time it is a remarkable example for the Berlin engineering profession. The highest level of the bridge carries the oldest elevated railway of the city, doing so since 1902. In 1949, the East German government dedicated one of East Berlin's main roads to the Soviet dictator Joseph Stalin – Frankfurter Allee was then called Stalin Avenue. The first new buildings along this route were housing estates in the tradition of 1920ies modernism. But soon, the rulers regarded this architecture as “too primitive” and “unworthy for the working class”. Therefore they launched a new housing project in 1952, creating an imposing axis towards the city center with apartment blocks in an opulent Stalinist “Gingerbread style”. The avenue was proudly presented as a promise of a better future in Socialism. The street, which later was renamed Karl-Marx-Allee, gets you in touch with East German history. 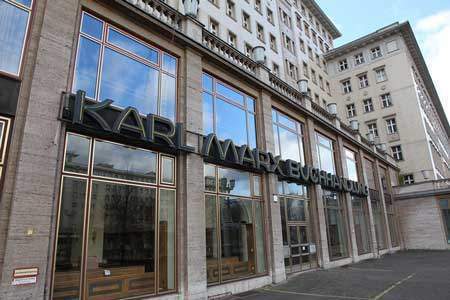 At Karl-Marx-Allee's Block-C-South you can still find traces of business life in East Germany in the letters marking the former Karl-Marx-Bookshop. The store extended over two floors and exuded a bourgeois solidity with its perfectly fitting wooden furnishings. It was one of East Berlin's best known bookshops. After having been immortalised in the films “Good bye Lenin!” and “The lives of others”, two brilliant movies about life in East Germany, the bookstore finally closed down in 2008, marking the loss of a location rich in tradition. The square is dominated by two stepped twin buildings with 13 storeys. 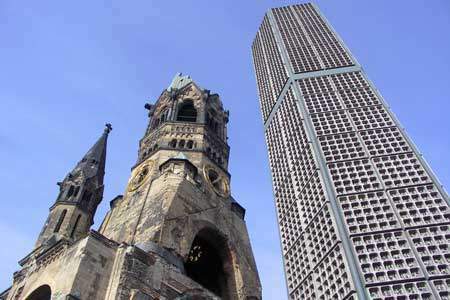 The northern tower was known as “House Berlin” and was famous in East Berlin for its gastronomic services. Its restaurants and bars were open till late in the night. The southern tower carried the name “House of the Child” and focussed on the needs of its young guests. A department store offered toys and children's clothing on two floors, and to give the little ones the feeling of being grown up, a café on the top floor of the tower allowed access to adults only if they were accompanied by a child. After the end of the GDR in 1990 the state-run shops and restaurants at Karl-Marx-Allee were closed down. When you make your way north from the eastern city centre, you’re sure to break a sweat, especially if you go by bike. From Torstraße, Schönhauser Allee leads steadily uphill to Prenzlauer Berg – this junction was also the border of Berlin’s city limits until the 19th century. Now, it is one of the main thoroughfares in this popular district. At the bottom of the street around the former Pfefferberg brewery – a popular venue – you’ll find the first gastronomic hotspot. The street becomes particularly bright and bustling at the U-Bahn station Eberswalder Straße, where it crosses Kastanienallee and Pappelallee. These streets are also brimming with trendy eateries, stylish bars, funky shops and cool hangouts. Welcome to hipster central! Since the 1840s, new breweries opening in the area played an important role in the development of Berlin’s Prenzlauer Berg district. The Pfefferberg brewery was founded by the Bavarian Joseph Pfeffer, who was its namesake. This hilly area in northern Berlin provided clean groundwater and sandy hills ideal for building storage cellars. With these newly founded breweries came beer gardens and city day trippers, which were soon followed by real estate speculators and tenement houses. The Pfefferberg brewery turned off its taps for good in 1921; in the following decades, the former brewery housed a bakery and print shop as well as other businesses. After the Wall came down, it was successfully transformed into a cultural and gastronomic hub. In 2013, the brewing tradition was revived with the craft beer Pfefferbräu. Cheers! Schultheiss was once a major player among Berlin’s breweries. These ornate brick buildings – built by the architect Franz Schwecten in an impressive complex around a large inner courtyard between 1887 and 1891 – testify to the label’s former greatness. The brewery filled its last bottle in 1967; since then, the factory buildings have been used in many different ways. The alternative club Franz-Klub, one of East Berlin’s few music clubs, opened here in 1970. After the collapse of the GDR, the party really got started; the halls were host to the parties and concerts of the wild, post-Wende years. 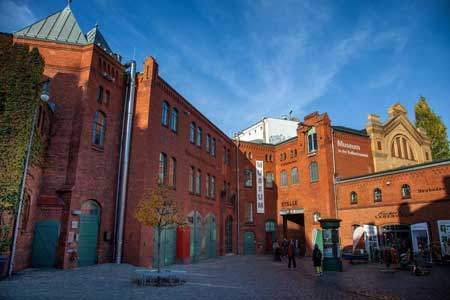 The “Kulturbrauerei” (literally, culture brewery) was born. Both the wild times and rundown charm are long gone. The brewery underwent extensive renovations from 1998 to 2000 and now houses a mix of culture, museums, parties and businesses. The Gründerzeit era buildings on this street stand close together, each of their richly ornamented stucco facades trying to outshine all the others. The neighbouring streets also have a similar splendour. Although Prenzlauer Berg is now popular and well-known for such Old Berlin flair, this wasn’t always the case. It may be hard to believe, but the GDR were actually planning a complete demolition in favour of a prefabricated Plattenbau district. Because the stylish front buildings once hid apartments for the poor, where inhabitants lived with a dreary view over dark, stuffy back courtyards and had no loo or bath of their own, the tenements of the former century were considered the epitome of workers’ misery. Luckily, the politicians later changed their minds; in 1987, this street shined in new splendour to commemorate Berlin’s 750th anniversary. 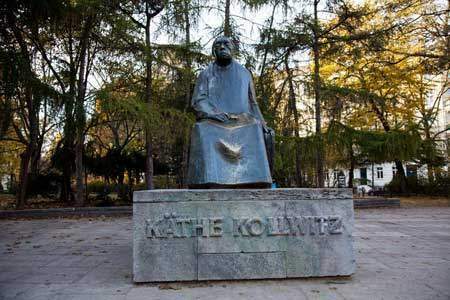 At the heart of Prenzlauer Berg, Kollwitzplatz pays tribute to the great graphic artist and sculptor Käthe Kollwitz, who lived a few houses away from the square until 1943. This is the perfect place for any Berliner who wants to feel like a tourist in their own city – the chance of meeting any original inhabitants is basically zero. After 1990, the area was modernised which majorly displaced the alternative culture scene this East Berlin neighbourhood was well-known for. With its immaculately restored old stucco buildings, fancy shops and cafes, the results have created eye candy for tourists and a gentrified paradise for top-earning new comers. Let’s enjoy another latte while Theodor, Cecilie, Victor and Helena play at the nearby playground under the ever watchful gaze of the local super mums. Nicknamed “Dicke Hermann” (fat Hermann), Wasserturm is located at the corner of Knaack and Rykestraße. Because it provided living space for operating personnel under the storage tank at the top, this stocky water tower, built in 1877, has a surprisingly large number of windows. Wasserturm lost its official use a long time ago and now houses private individuals. It is part of a larger industrial monument which also includes the overgrown hill – old water storage areas are still hidden in its depths – and a slender yellow brick tower. 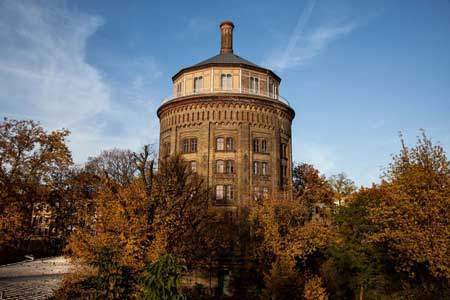 As early as 1856, this standpipe tower and a water depot made up Berlin’s first waterworks. Together, they controlled the water pressure in the city’s water pipes. Follow one of the paths up the hill for a great view of the neighbourhood and Fernsehturm (TV Tower).